The art therapy craze continues with this monthly colouring title! Every issue features beautiful handcrafted patterns to unlock your inner creativity, balancing your physical, spiritual and emotional well being.. It’s time to Relax with Art. It's a wonderful magazine. I have no complaints. I enjoy receiving it each month. good quality, excellent content. My chill out time. Love this !!! Brilliant service all round!! It's the best coloringbook ever. This issue was just as good as they use to be. I love this magazine. the pictures are lovely designs. Like everything about it. Look forward to receiving it every month. Love this magazine, in particular the way you can interact with it on FB and possibly have your picture in the gallery. The drawings are clear and has different subjects. I like this magazine a lot. I love this magazine. Great pictures to colour and reasonable price! I only noticed these from issue 3, I was advised by my cpn/psychiatrist to give them a go as I have various mental health conditions including bipolar, I thought they where talking garbage at first, but wow they really calm me down and when I'm in a manic energetic state of mind they help keep me some what grounded (as much as possible) deffo worth it! I love them.but I like more mandala patterns and these have more scenic lately which I leave so not sure wether to carry on. I love the pictures . Such a variety. Variety. Buildings. Quality of paper. Loving the colouring magazines really relaxes me!! Since i found that colouring is so calming i find myself doing this every night. Your colouring books are exceptional printed on good paper so that i can use felt tip pens without ruining the page below. It is a very good therapeutic adult colouring art book. This are my favourite monthly books ever. Im disabled and these thanks to these books im able to keep my pain levels down. Im able to zone out and go into my own little world, love them. Thank you. Very good quality magazine with great colouring designs. no negative comments from me. Look forward to each issue, great variety, good quality. It was bought for a friend and she s really impressed with the magazine. Will resubscribe for her. Varied subject of pictures covered in this magazine. We do not get a any type of magazines that compare with Relax With Art. The picture are so varied and truely beautiful and fun to do. As a Canadian I am proud to say I love to say am of British decent! I love this magazine. It keeps me busy for the whole month. A nice assortment of pictures. While I don't care for all of them ( I don't like fish) there are always more that I do like. Thank you for such a great magazine. I love these colouring books!!! Excellent pictures for therapeutic colouring. Excellent price and delivered direct to my door. I would recommend to anyone. Love the clarity of print and the single sided printing, because I colour with pro-markers and they sink through the page. As above have bought other mags but relax with art by far the best. I love the magazine. It is by far the best of the colouring magazines available. I love the variety of different pictures each edition, the themed ones, like the Halloween edition are my favourites. The competitions that are run occasionally are also very fun to enter too. They are also extremely relaxing to do. The pictures are so unusual and at the same time of everyday scenes and visions.Way out shines all the other publications,as well as delivered to your door. I like these magazines, they pictures are interesting, detailed and a nice variety. Like that they are stapled so easy to fold open or even fold the book over for when I am out and about colouring. ALso like that there is nothing on the back in case it bleeds thru which rarely happens. i enjoy relax with art as its great for keeping my mind active and gives me something to look forward to. Great variety of good quality pictures in each magazine. Love the pictures have recommened to others. Great magazine, some of the art not to my taste, but plenty to choose from. Good quality paper. Easier to colour when fitted to a clip board, with card between pages to stop colour bleed through. Over moon with thsee books look forward to the next issue that comes... great range of designs and pictures. I love everything about the magazine. The quality,designs are all excellent. No negatives at all. Keep up good work. absolutely fabulous colouring in books. I've subscribed to these & the quality is excellent. The pictures or patterns are on single pages so when coloured in it does not bleed onto next page. I've also got the first couple of the specials & now looking into getting the pocket sized ones. I would highly recommend these to everyone. Keep them coming Relax with Art ?? Love it looking forward to receiving the rest of the series. I like the fact the designs are on one side of the page only as colours bleeding through can be a problem. Pleased with the mag and am enjoying using it. I like the quality and range of designs. It's good that the designs are only on one side of the page so that it doesn't matter if colour bleeds through. The pare quality is fine. I love this magazine. It has a good variety of patterns. The quality of paper is really good too. Colours don't bleed through to the next page. I had copies of issue 1 and 3 but somehow missed issue 2. I contacted this phone number 0845 303 6750 and spoke to a lovely lady. I asked if she could send me a copy of issue 2. I received it yesterday so a very big thank you for that. Try this magazine for yourself. You won't be disapointed. I have always liked colouring, mainly Mandala patterns. I then saw a weekly 'magazine, called "Art Therapy" and decided to subscribe - it was weekly and cost £2.99 per issue. I decided to subscribe and they were supposed to send 4 issues at a time, monthly. 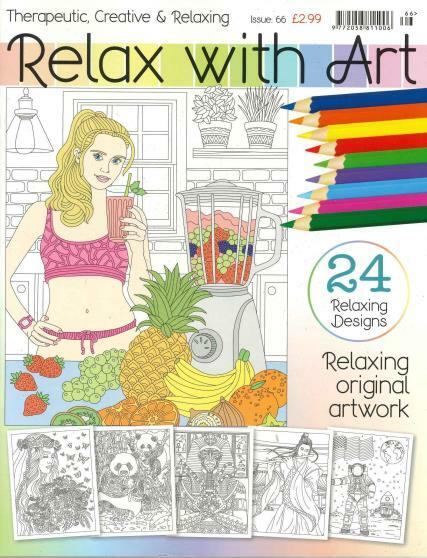 I then saw the first "Relax with Art" magazine and loved it. The Art Therapy soon proved to be unreliable. I only had 2 issues at a time and they were sent at random intervals and not in sequence. Plus the quality of the patterns deteriorated. So I quickly cancelled that subscription and took out one for "Relax with Art". I now await my first delivery, of issue 3. Happened to see it in Sainsburys and had a look. Great - can't wait! Would HIGHLY recommend.